Betty Jean is your typical New England yacht. Seeing 3-4 months a year of in water time, the rest of the time being under cover. 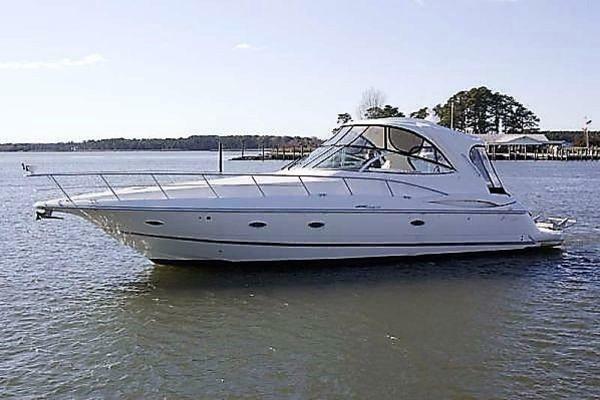 Showing like a significantly newer yacht, yet priced with the pack, this yacht represents a nice opportunity to own a proven cruiser in above average shape, ready to cruise now. Come take a look or make an offer you will not be disappointed. The cockpit of the 530 is very spacious, it features a walk through transom with a swim platform. At the swim platform there is a ladder as well as a hot and cold shower. As you step into the cockpit there is the hatch for the engine room, a ladder to the fly bridge and fender storage. As you step in to the salon from the cockpit, there is a large 8 foot sliding door with a screen door as well. 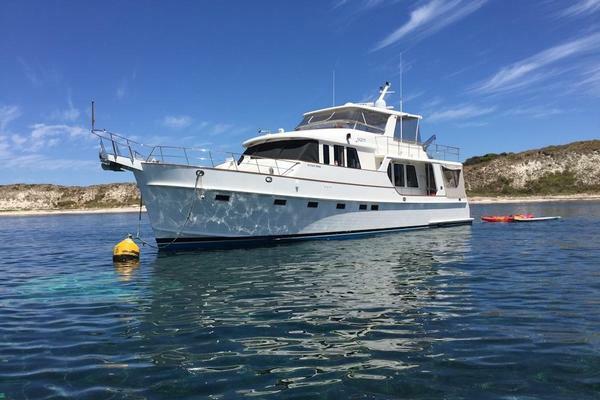 On the port side is a built in tv storage cabinet, and on the starboard side is a ultra leather sofa with two end reclining sofas. Centered at the sofa is a hydraulic Cherry dining or coffee table. Forward in the salon are the AC and DC panels, and the galley. Just forward of the salon is a open galley. It features a three burner stove, with a oven, as well as a microwave/ convection oven. Above the stove is the built in coffee maker and plenty of pantry storage. Similar to other 530's it has a two unit subzero refrigerator and freezer and karadon countertops. All of the cabinetry is cherry, and has been well maintained. The pilot house is one of two helm stations. After you walk forward in the boat it is offset to the port side with a wrap around seating area and a large leaf table. At the helm is a flexsteel ultra-leather 6-way electrically adjustable door, it has the ability to swivel to face the table and the rest of the seating. At the helm is a full suite of electronics, and overhead is red night light illumination for going underway at night. The bridge enclosure is 2" welded aluminum pipe with a extended cover that has ridgid glass forward and aft and flexible Strataglass to the port and starboard sides so the windows can be opened, for a breeze. There are two access points to get to the fly bridge. One is a ladder at the cockpit and the other is stairs through the pilot house. Aft of the fly bridge helm is a U-shaped settee with seating for ten. At the center is settee is a table that drops down and creates a sleeping berth for two. At the fly bridge helm is a full suite of electronics, so the vessel can be piloted from the pilot house or fly bridge. At the rear of the fly bridge is a 600 lb dinghy davit crane with a cradle on deck for a hard bottomed inflatable. All the way forward is the guest stateroom, it features a oversize inner spring queen mattress. There are (4) port lights, a opening round overhead hatch, and recessed halogen lighting. For storage there are two drawers at the foot of the bed, a cedar closet and other storage outboard. The guest head has two entrances, one from the corridor and another from the guest stateroom. It features a separate shower stall with a glass door a mirror with a vanity and a fresh water Vacu-flush head. Across from the guest head is the bunk room. The bunk room was designed so that it could be converted into a office, or leave it as is with two large 7' bunks. As you come down the steps into the staterooms immediately to your port side is the Master. There is a center line Vera Wang mattress, with opening ports behind the berth. Over head is recessed lighting, and reading lights on either side of the berth. 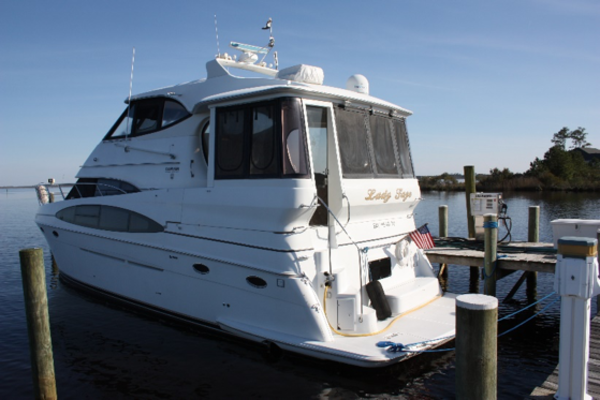 The master bath is directly across from the berth. In the center is the vanity with a sink and storage below. To the right is a enclosed Shower with a small bath tub, and to the left of the vanity is a separately enclosed Vacu-flush freshwater head. Hidden behind sliding cherry doors is a Malber washer and dryer. There are two large cedar hanging closets and storage drawers below the berth.